Just enter your e-mail address below and click “Submit” to get free tips by e-mail. 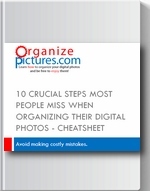 Most people want to just organize their digital pictures and ignore these crucial steps right at the beginning…when they are shooting and transferring their digital pictures. Then they wonder why they can’t organize their digital photos! Avoid most people’s mistakes and start on the right track! Get 10 Crucial steps NOT to miss, absolutely free, along with media organization tips & tricks delivered directly to your inbox. Plus, get an exclusive video presentation to walk you through these steps. Enter your name and email below and click the “Download Now” button. P.S. : ‘Cause we all hate spam e-mail I will not share your e-mail address with anyone else. It’s that simple !